Figure 2. A-431 cells were grown to 90% confluency, serum starved overnight, and either untreated or treated with Human Epidermal Growth Factor (hEGF) #8916 (100 ng/ml, 5 min; upper). 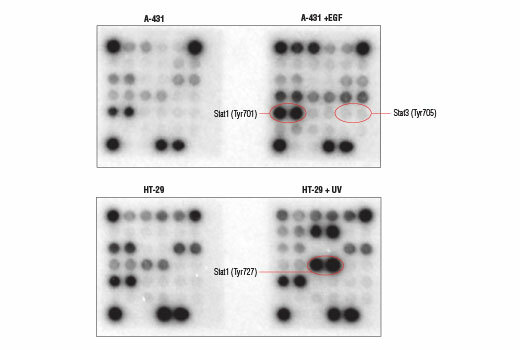 HT-29 cells were grown to 80% confluency and either untreated or UV-irradiated and allowed to recover for 60 min (lower). Cell lysates were analyzed using the PathScan® Immune Cell Signaling Antibody Array Kit (Chemiluminescent Readout) #13792. Images were acquired by briefly exposing the slide to standard chemiluminescent film. Figure 3. Ramos cells were serum starved (3 hr) and either untreated or stimulated with anti-human IgM (12 μg/ml, 5 min; upper). 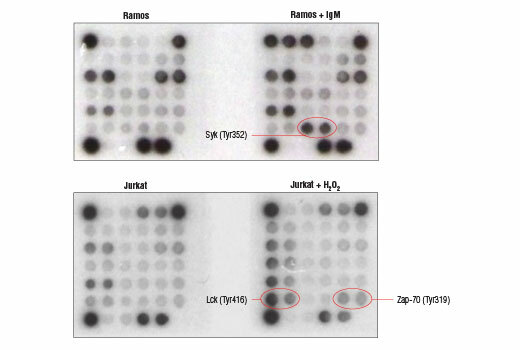 Jurkat cells were either left untreated or stimulated with H2O2 (10 mM, 3 min; lower). Cell lysates were analyzed using the PathScan® Immune Cell Signaling Antibody Array Kit (Chemiluminescent Readout) #13792. Images were acquired by briefly exposing the slide to standard chemiluminescent film. Figure 1. 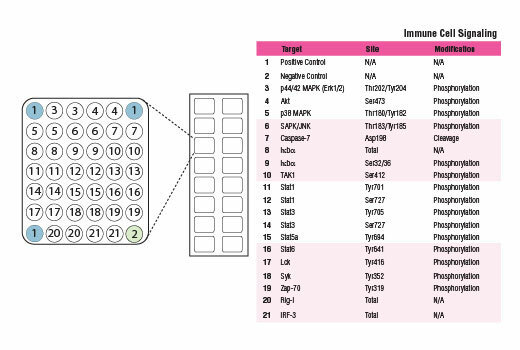 Target map of the PathScan® Immune Cell Signaling Antibody Array Kit (Chemiluminescent Readout) #13792. The PathScan® Immune Cell Signaling Antibody Array Kit (Chemiluminescent Readout) uses glass slides as the planar surface and is based upon the sandwich immunoassay principle. The array kit allows for the simultaneous detection of 19 signaling molecules that are involved in the regulation of the immune and the inflammatory responses. Target-specific capture antibodies have been spotted in duplicate onto nitrocellulose-coated glass slides. Each kit contains two slides allowing for the interrogation of 32 different samples and the generation of 608 data points in a single experiment. Cell lysates are incubated on the slide followed by a biotinylated detection antibody cocktail. HRP-linked Streptavidin and LumiGLO® Reagent are then used to visualize the bound detection antibody by chemiluminescence. An image of the slide can be captured with either a digital imaging system or standard chemiluminescent film. The image can be analyzed visually or the spot intensities quantified using array analysis software. PathScan® Immune Cell Signaling Antibody Array Kit (Chemiluminescent Readout) detects the target proteins as specified on the Array Target Map. No substantial cross-reactivity has been observed between targets. This kit is optimized for cell lysates diluted to a total protein concentration between 0.2 and 1 mg/ml (see kit protocol). All sandwich assays have been validated for human-derived samples. This kit detects proteins from the indicated species as determined through in-house testing, but may also detect homologous proteins from other species. The vertebrate immune response relies on both a non-specific, innate immune system and an antigen-specific, adaptive immune response. Organisms rely on cell-mediated and antibody-mediated responses to detect pathogens and protect against infection and disease. Inflammation is an immune response in which circulating immune system cells localize to sites of injury or infection. Regulation of inflammation is essential, as unchecked inflammation can result in permanent damage to tissues and organs. A variety of signaling proteins are known to regulate the immune and inflammatory response. Akt and p44/42 MAPK (Erk1/2) kinases are key regulators of cell fate that generally transmit growth promoting and survival signals. These two kinases serve as major signal integration hubs and very few cellular processes occur without their involvement. Both p38 MAPK and SAPK/JNK kinases are activated through a dual phosphorylation mechanism in response to pro-inflammatory cytokines, stressful conditions, or genotoxic stress. Caspase-7 is an intracellular protease involved in apoptosis and is part of a cellular sub-organelle called the inflammasome. Caspase-7 is activated by cleavage at Asp198. Activation of the essential immune system regulator NF-κB is triggered by a diverse group of extracellular signals promoted by inflammatory cytokines, growth factors, and chemokines. The proteasome-mediated degradation of the NF-κB/Rel inhibitor IκBα results from phosphorylation of IκBα at Ser32 and Ser36 and targeting of IκBα to the proteasome. The TAK1 kinase responds to a variety of cytokines to regulate cellular kinases and activate the NF-κB pathway; phosphorylation of TAK1 at Ser412 by PKA regulates kinase activity. Stat family transcription factors are activated by a variety of cytokines, chemokines, or growth factors to regulate the immune response. Phosphorylation of Stat proteins at specific tyrosine or serine residues leads to Stat protein dimerization, nuclear translocation, and binding of the transcription factor to genes that regulate the immune response. The range and specificity of responses regulated by Stat proteins is determined in part by the tissue-specific expression of different cytokine receptors and by the combinatorial coupling of various Stat members to different receptors. Lck, Syk, and Zap-70 are Src family tyrosine kinases that couple the activated B cells and T cell immunoreceptors to downstream signaling events that mediate the immune response. Rig-1 is a Toll-receptor signaling complex component that plays a role in the antiviral innate immune response. The transcription factor IRF-3 plays a role in regulating interferon (IFN) and IFN-inducible gene expression in response to viral infection. Sojka, D.K. et al. (2009) Immunol Res 45, 239-50. Si-Tahar, M. et al. (2009) Clin Exp Immunol 156, 194-8. Girardin, S.E. and Philpott, D.J. (2009) Semin Immunol 21, 173-4. Lukic, M.L. et al. (2009) Mol Immunol 47, 1-2. Gaestel, M. et al. (2009) Nat Rev Drug Discov 8, 480-99. Nag, K. and Chaudhary, A. (2009) Curr Signal Transduct Ther 4, 76-81. Müller-Hübenthal, B. et al. (2009) Anticancer Res 29, 4795-805. Yu, H. et al. (2009) Nat Rev Cancer 9, 798-809. Grivennikov, S.I. et al. (2010) Cell 140, 883-99. Maletzki, C. and Emmrich, J. (2010) Dig Dis 28, 574-8. Davis, B.K. et al. (2011) Annu Rev Immunol 29, 707-35. Newton, K. and Dixit, V.M. (2012) Cold Spring Harb Perspect Biol 4. Mantovani, A. and Garlanda, C. (2013) Nat Immunol 14, 768-70.